In January I traveled down to the Lake Okeechobee area and filmed a hog hunt out of this wicked swamp buggy, just one of several rigs you’ll see on this all-new episode. New custom models too, like these AEV conversion rigs. 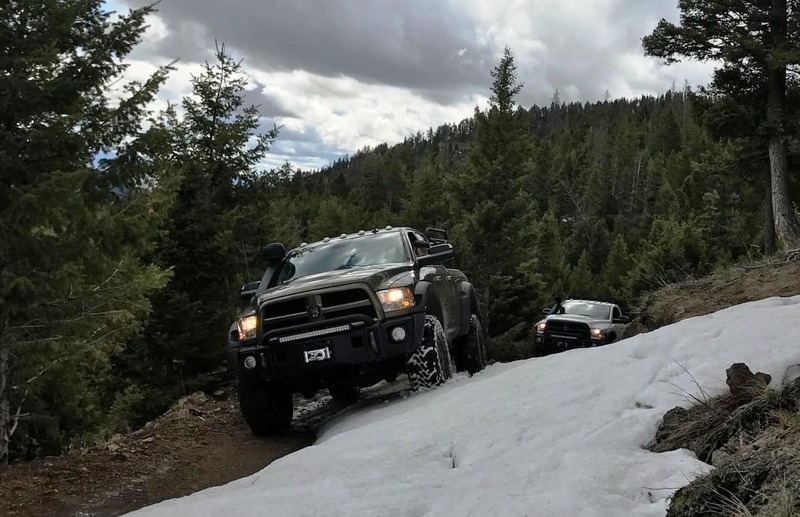 Hunters love their trucks, and you gear heads will love this show. Tonight, Wednesday, 7 PM on Sportsman Channel (605 Direct TV) set your DVR. The health care chaos last week on Capitol Hill notwithstanding, things have been looking pretty good since President Trump’s election last November. The stock market is up and consumer confidence is high as the President reduces burdensome regulations on business and moves to act on tax reform this summer. But ironically the election of our first pro-gun president in 8 years has slowed the sale of firearms and softened the overall shooting/hunting market. In recent years, with anti-gun Barack Obama at the helm and with the prospect of Hillary looming for another 8 years, law-abiding and freedom–loving Americans had a deep and well-founded concern that their gun rights were in serious jeopardy, and so we purchased guns and hoarded ammunition at a record pace. But now, with President Trump in the White House and our Second Amendment rights secure for now, firearms sales have slowed and as a consequence cast a pale over the entire industry. Colt, Savage, Remington and Federal Premium recently announced that they are constricting business and laying off employees, and many industry experts predict that other manufacturers will follow suit. The record sales and profits from firearms and especially ammunition of the last 5 years carried over into the general outdoor and hunting market, and helped to account for decent to good sales. For example, a guy walked into a Cabela’s store to buy 3 boxes of ammo, and he picked up a new camo jacket and some other stuff on the way to the register. But many of those impulse buys have dried up and dried up fast. In addition to declining gun/ammo sales is the overall retail industry’s struggles of 2017 and beyond. Namely, how do retailers with heavy investment in brick-and-mortar survive and grow in the Amazon world? You likely have empty storefronts in your hometown that thrived just 5 short years ago. 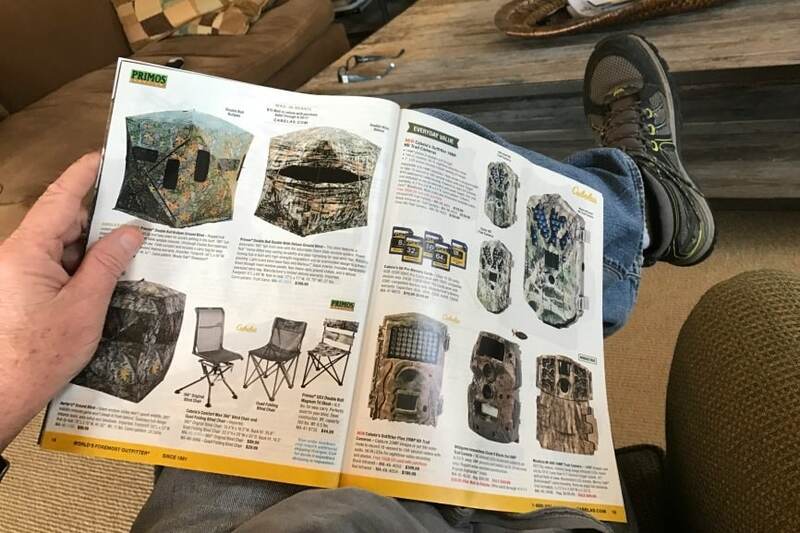 You might have heard that Gander Mountain recently declared bankruptcy, and as a part of that will close 32 of 162 retail stores in 11 different states. Click to see if a GM store near you is on the list to be shuttered. Word is that Bass Pro Shops’ $4.5 billion deal to buy Cabela’s could be in jeopardy as federal regulators have requested more information from both parties. But most financial experts predict that the merger will still be approved and completed, most likely later this fall. 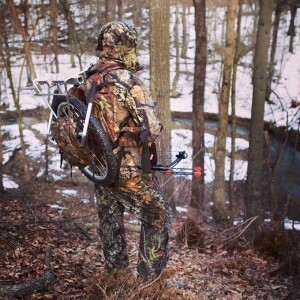 The bowhunting industry is not immune. The Outdoor Wire spoke with industry experts who pointed to significant problems facing the archery business and the considerable drop-off in bow and gear sales. One big reason—the trend of manufacturers toward high-end bows that cost $1,000 to $1,500. Not all hard-working hunters can fork out a good chunk of a mortgage payment for a new bow, so fewer bows are sold each year, and people are upgrading less and keeping their bows for 4 or 5 years. While the gun/bow/hunting/outdoor industry is facing uncertain and tough economic times, there is light on the horizon. If President Trump can get our dysfunctional Congress to work together for once and approve meaningful tax reform for corporations and individuals alike this summer, and retroactive to January 1, 2017, the industry (and all retail) will receive an immediate boost. History shows that every time people get even a little more money in their pockets, they will spend some of it on their passions. 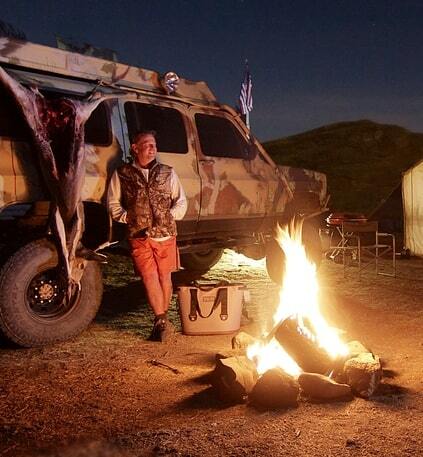 There are no more passionate Americans than deer hunters. Give us back some more of our money and we’ll buy a new rifle or bow or trail camera or camo, just in time for the 2017-18 season. As for the manufacturers, you will continue to see some constriction and shifting business strategies in the short term, but that can be a good thing. Smart business leaders step back, analyze changing market trends and then build and market products that people will buy in 2018, in this case quality and affordable guns and bows. For retailers large and small, the future is inescapable and simple. We all still love to go to a Cabela’s, Bass Pro or Gander store, and we love our local gun shop. We’ll still buy at those stores, but if a company is not heavily online and Mobile, they’re out of business or soon will be. What about you? Are you spending less on gear? Buying more online? Will you purchase a new gun this year? Does a new bow cost too much? 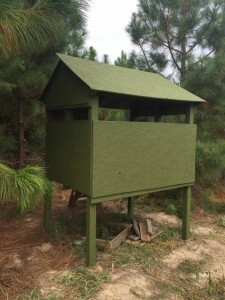 Hello Mike, thought I’d pass along a few pics of a couple deer blinds we made out of old swing/play sets for kids. Start with the wooden frame of an old play set, similar to the picture below. The old sets we used were both headed to the landfill. You can often find free ones in local papers or on Craigslist. I always get taxidermists to do my European mounts with no plaque. They look better and more natural with just skull and antlers, nice for setting in a corner, on a shelf, on a coffee table… Besides, I have never seen a wooden or steel wall skull mount that I like, until now. 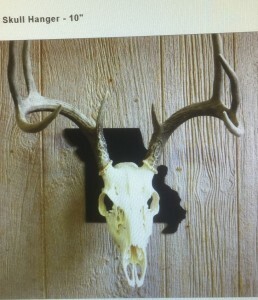 The State Skull Hanger from The Taxidermists’ Woodshop is a pretty cool idea. 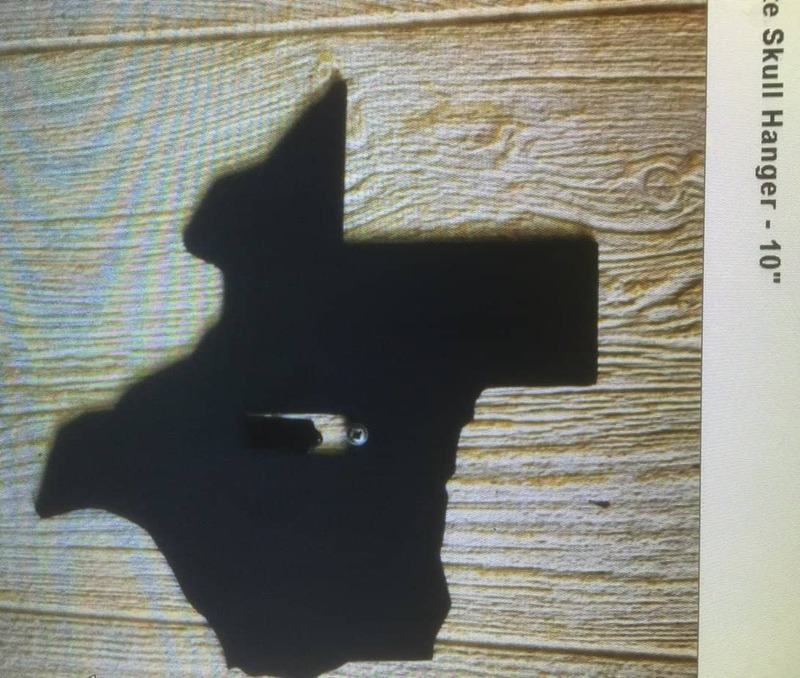 Pick the state where you killed the buck, and order that state’s hanger to display the skull/antlers on your wall. The 10” steel hangers come with a flat black finish (other finishes available). Screw hanger to the wall and slip the skull down on the peg hanger. I have not used or purchased one of these, so I cannot tell you how sturdy and secure the peg is, though it looks to me like it will work fine with a whitetail rack. 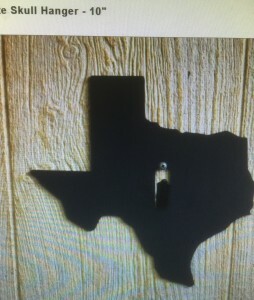 You can also use it to hang a bear or cougar skull on the wall. Great price at $19.50 plus shipping; usually ships in 5 days. What do you think? I can envision you hanging 3 skulls from your home state in a pattern on the den wall…or really cool, say you have 5 skulls lying around from bucks you shot in 5 different states; hang those state skull racks in a row behind the bar in your basement for around $100. I think that some of you will read this and order one or two. If you do, hang those skulls and send me a picture so I can do a follow-up post. Hunters have been packing out deer, elk, sheep and other big game for decades on pack animals, or making multiple trips out of the backcountry carrying heavy loads on their backs. Teem LEED introduces the world’s smallest, collapsible, user-adjustable big game cart for making that work easier and more efficient. The Honey Badger is a game changer. 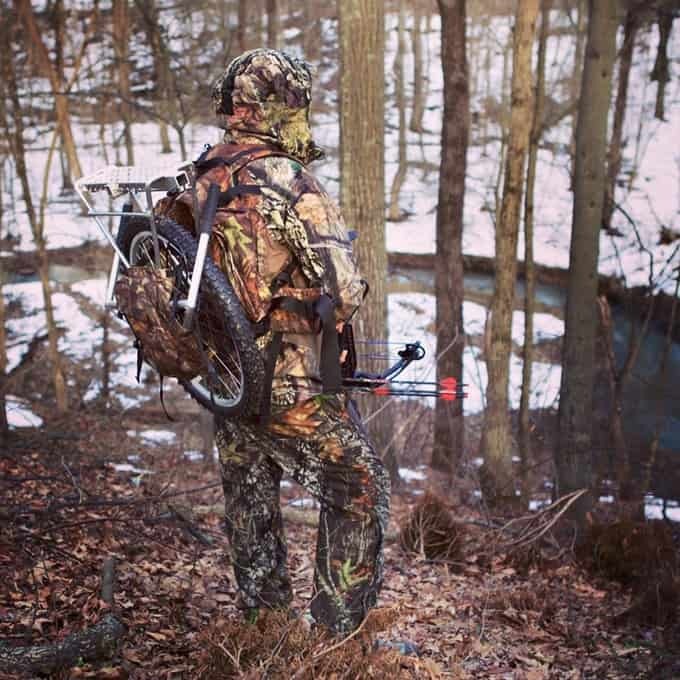 It is the first lightweight all-terrain pack wheel designed for deer and elk hunters. This multi-purpose game cart can pack out an entire elk, deboned or quartered, in one trip. 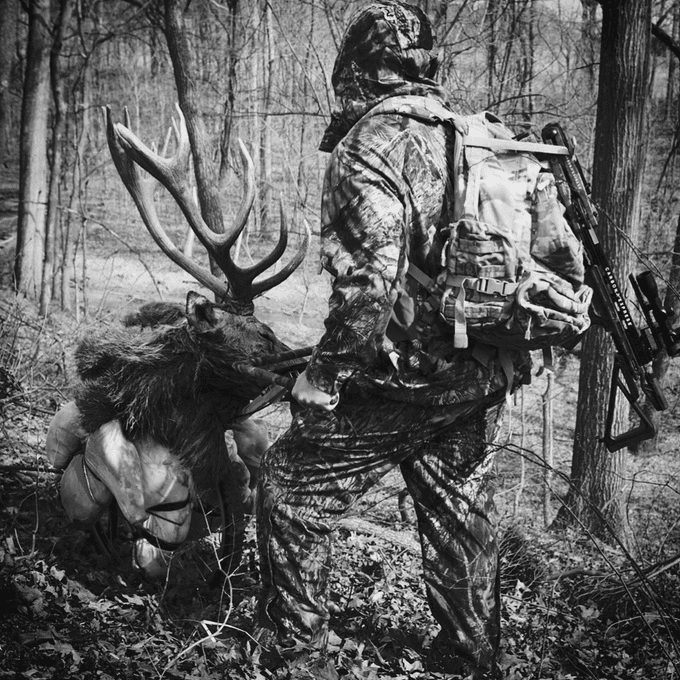 With the deer accessory, it can roll an entire deer out of the woods. 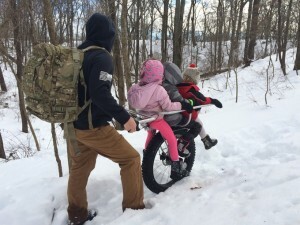 It straps to your backpack for the hike in and weighs only 13.5 pounds. 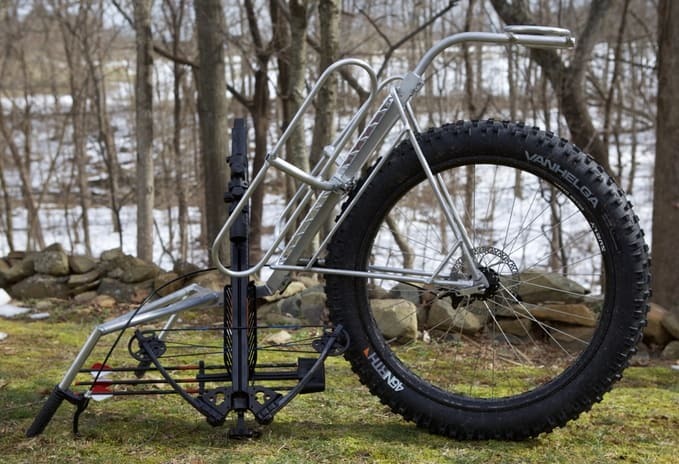 The kit comes in multiple wheel sizes with or without disc brakes, and accepts bicycle panniers or pack animal saddle bags. The wheel can carry a buck up to 200 pounds with the deer accessory. Other big game such as elk can be carried out deboned or quartered, with up to 250 pounds of meat on the frame. The difference between the deer and elk weights–deer are carried on top, whereas quartered or deboned game are carried lower directly on the sides of the frame, which allows for more weight. To carry a deer, you add sidebars and a front load bar. The wheel is placed upside down on top of the animal with the handlebars directly over the neck. 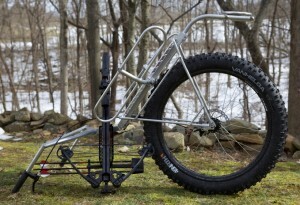 The neck is strapped to the top handle bar and the lower quarter to the two side bars. Then the user flips the wheel right side up. It is simple physics. The load is carried completely over the axle of the patented frame design. 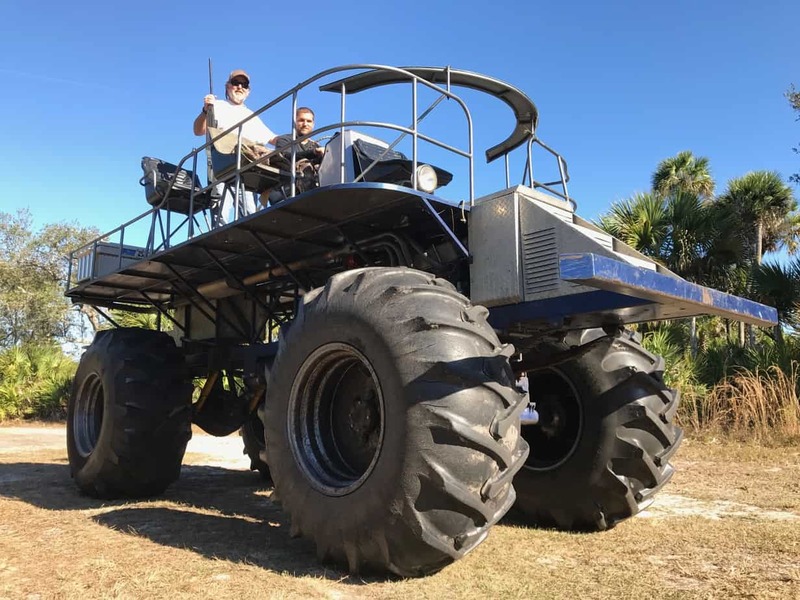 The Honey Badger Wheel is the alternative to pack animals and gives backcountry hunters the ability to take out all their meat without the heavy load on the back. It is the first hunting product offered on the crowdfunding site kickstarter.com and is available for purchase now until the end of April. Purchasing the setup now saves you 20% off the future website price, and all supporters receive the Honey Badger Wheel between July and August 2016, just in time for the season. Visit kickstarter to see the Honey Badger Wheel in action and support the project. Hanback here: I find it very cool that the Honey Badger doubles as an off-road stroller/kid carrier. 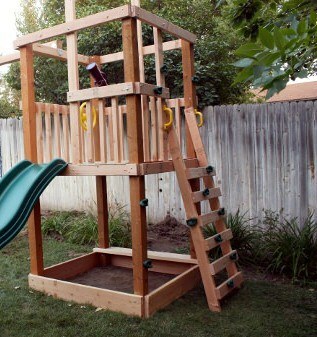 Young, active outdoor families will love that. While we’re at it, have you ever used a cart or similar carrier to get your deer out? I never had, but now I’m thinking I might. Sure does save your arms and back.